I just saw your takeover of the project, it's a gret news. I'm a french avid user of your programm. - Accès to system share folder (c$, d$), with integration of windows explorer in tab. - An history in database to know who made change. We are using the application in workgroup. - possibility to add manually tools, like ssh transfert. In any case, thank you for continuing the development of this useful application, while maintaining the lightness,graphic simplicity and responsiveness, which are lacking from your paid competitor . Anyway, about the topic. I like free programs but I don't mind paying for them either, if they are worth it. One of such programs, for instance is PicPick, a screenshot tool (yes, even better than snagit imho). is getting bloated with free extra software, so you need to pay attention when installing. Why would I pay 30 bucks for a paid version then? Well, they promise a lifetime license and then I don't mind paying 30-50 euro's for a program, knowing I am supporting the development of a great tool. Another free program I like is Sandboxie (http://www.sandboxie.com/), a tool to run a program in a sandbox (you know them keygenerators can be tricky sometimes ) Again, no difference between the free and the paid version, accept that the free version will give you 5 seconds delay before you can use it. Here they also provide a lifetime upgrade license for around 30 bucks and I am planning on getting that licensed as well. So, what style of licensing I don't like? For instance Nero, a CD/DVD/Blueray burning tool (http://www.nero.com/eng/). Okay around 50 bucks for the basic verion should be no problem. But then it comes, every year they bring out a new version, with little extra features or added value. So after one year, you're left hanging with an outdated version of the product, and the solution, of course pay another 50 bucks or slightly less for an upgrade version. Those schemes where you have to keep on pulling your wallet to keep on using a product (and of course you would always want to have the latest version), is not the way to go in my opinion. - what the poster (bendab) above me already mentioned, access to the admin shares on a windows machine is pretty nice. I reminds of the VMware Guest Console (VGC) feature (http://labs.vmware.com/flings/vgc). With VGC you can browse explorer style through your VM's. You can also stop and stop processes within the VM and a very nice feature I find, is to start an application (only portable applications) within the VM, while the executable resides somewhere on your local disk for instance. - adding PsExec (http://technet.microsoft.com/en-us/sysinternals/bb897553.aspx) features can be nice and once you combine those with NirCmd (http://www.nirsoft.net/utils/nircmd.html) you can do some hefty tricks on a remote machine. E.g. unmute a computer, put the volume on maximum and play a movie on screen. Well, I think I'm out of babble for now. Thanks for the feedback and ideas everyone. I would also recomend a "freemium" aproach. Good core features, expanded for paying customers. as a sidenote, I'm all using this tool for some time, and so do the other IT at work. We'll recently hhad a chat with our CAO regarding the benefit of supporting the development of quality software. - Automatic reconnect for ssh when disconnected. SecureCRT implements this by having the enter key reconnect when the session has disconnected. Thanks much for a great product. Very nice app. It might have good future if you won't quit enhancing it. I am using PuTTY Connection Manager and it allows me to use login macro feature that saves me minutes/hours by entering usernames (and optionally, passwords) when initiating Telnet and SSH session, which us awesome. If you can add same feature to mRemoteNG, I will be the first one to donate and move to mRemoteNG. As for now, I will stay with PuTTY CM. yakuza wrote: I am using PuTTY Connection Manager and it allows me to use login macro feature that saves me minutes/hours by entering usernames (and optionally, passwords) when initiating Telnet and SSH session, which us awesome. You can even choose for each connection the Putty settings you want. MremoteNG is a very nice an usefull app! 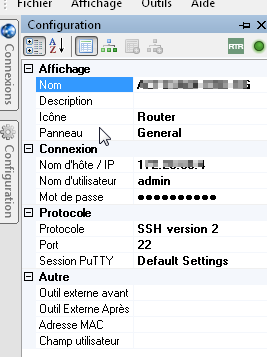 What you say is only true for SSH, because SSH support username/password pre-provisioning... If you try to configure Telnet - you will see there's no option to specify username. Well... I have donated few minutes ago. We switched to SSH in the company and now your tool is very neat for me. I am very sorry your situation, I'm sure this level you have, God rewarded you! I want to thank you for this great contribution, excellent program, which is helpful for administrators or beginners area! I am aware that there are others on the Web, but in particular, this was the most pleased me.